Dr. Messenger Monsey, a True Norfolk Eccentric. In our sad, politically-correct culture, it’s getting harder to find a place for the genuine eccentric: the kind of person who is essentially harmless, but who goes his or her own way and refuses to bow to pressure to conform to general norms. Such a person was Dr. Messenger Monsey, an eighteenth-century Norfolk man who became something of a ‘pet’ amongst leading Whigs, despite his outspokenness, often rough and cutting wit and tendency to overly-familiar manners. Messenger Monsey was born in 1693 into a clerical family. His father had been Rector of Bawdswell, not far from Norwich, but lost his living when James II was deposed and he became a ‘non-juror’. His mother was the daughter of Rev. Roger Clopton, Rector of Downham. She was descended from the Messenger family, modestly wealthy local squires, hence her son’s odd first name. Despite losing his church living, Monsey senior was able to live in some comfort, thanks to an estate at Whitwell in Norfolk inherited through his wife. That was where the young Monsey grew up, being educated mostly at home until he attended Pembroke College, Cambridge, graduating with a BA degree in 1714. After leaving Cambridge, Monsey studied to become a physician as a pupil of Sir Benjamin Wrench MD, a noted physician of Norwich, being admitted to the Royal College of Physicians in 1723. What he learned under Wrench was to last him most of his life, for he became famous for refusing to adapt to newer styles of medicine. So far, so ordinary. After a brief period serving patients in villages near Swaffham in Norfolk, Monsey moved to practice in Bury St. Edmunds, Suffolk. It looked as if he would follow the pattern typical of country physicians in poorer areas: long days in the saddle moving between patients, a modest lifestyle and usually limited, even sometimes meagre earnings. Two things changed Monsey’s life in Suffolk: he married well, as his father had done, and he was called in to treat Francis Godolphin, 2nd Earl of Godolphin, who was taken ill with some sort of fit of vertigo on his way to attend the races at Newmarket. Monsey seems already to have developed something of his unique style of dealing with the great and mighty: direct, familiar almost to the point of discourtesy, and full of raucous and risqué humour. To his lasting good fortune, this seemed to go down wonderfully well with the Earl, who was something of a hypochondriac – as were so many of the wealthy classes of the time – and had feared he was about to suffer a stroke. Whether by luck or good medicine, Monsey affected a cure and Godolphin struck up a most unlikely friendship with the country doctor, eventually persuading him to move to London and finding him well-paid employment as physician to the Royal Hospital at Chelsea – a post he held until his death. Monsey even moved into the Earl’s London home instead of using the rooms available for him at the hospital. Now, like someone showing off a new pet to friends, Godolphin introduced Monsey to the leading Whigs, including the prime minister, Robert Walpole, another Norfolk man, and Lord Chesterfield. Once again, Monsey’s direct manner, near-insolent familiarity and total unwillingness to let himself be overawed by the company he was keeping proved to be a huge ‘hit’. He became a kind of unofficial court physician and jester to the Whig Party, which included several additional Norfolk gentry, such as the Townshends of Raynham and the Windhams of Felbrigg. 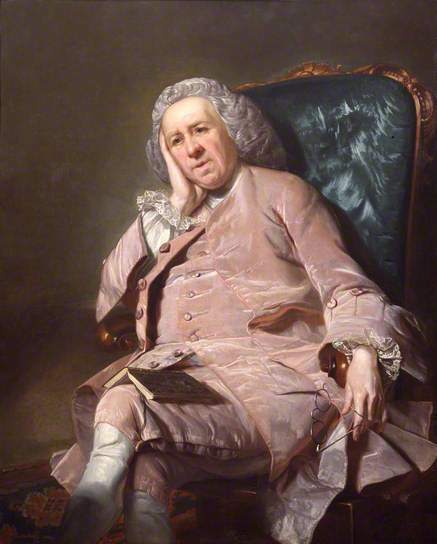 He also became a close friend of David Garrick, though they fell out after a while when Monsey’s open ridiculing of Garrick’s social pretensions proved too close to the bone. Dear Madame, now dead men’s ghosts are getting out of their graves, and there comes the ghost of a doctor in a white sheet to wait upon you. Your Tokay has got into my head and your love into my heart, and to my comfort I find a man may be in love and be happy, provided he does not go to book for it. I could have trusted till the morning to show my gratitude, but the Tokay would have evaporated, and then I might have had nothing to talk of but an ache in my head and pain in my heart. Despite his father’s High-Flyer and Tory views and staunch adherence to a belief in the traditional Church of England as the only true religious way, Monsey himself showed a strong aversion to Anglican beliefs and bishops, remarking in the long letter he wrote on the subject of arrangements after his death that a particular French bishop had acted “…like a man of sense and reason, and not like a bishop, who is, generally speaking, a superstitious bigot and a hypocrite.” Monsey himself rejected any belief in the Trinity, becoming a Unitarian and freethinker. He professed belief in some deity, but enjoyed making disparaging remarks about orthodox beliefs, especially the Athanasian Creed, which he called “Blasphemy and stupendous Nonsense”. Monsey suffered from a number of strange but deeply-held aversions. He distrusted banks or investment in government securities and was thus always trying to find new places in his rooms where he could secrete his cash. On one occasion, when he was about to travel to Norfolk for a time, he chose to hide his money, part coinage and part banknotes, by wrapping it in thick, brown paper and tucking it under the wood and ashes in the grate. Sadly, his maid later decided to welcome him back by lighting the fire, only to find the enraged doctor immediately dousing it, and her, in cold water to rescue his money! He was always fond of women and their company, but this gradually developed into a dislike of having to deal with all males, especially servants. One footman he employed had, so he felt, treated him badly and he therefore vowed never to employ another. When he grew too infirm to shave himself, a maid had to do it. Footmen sent to his rooms in Chelsea Hospital with messages were not admitted; nor was the barber who dressed the wig he continued to wear long after the fashion had changed. The dressed wig had to be handed over at the door. When his grandchildren visited him, the girls were welcomed gladly, but he often had to be persuaded to let the boys into his presence. He even carried this dislike of males into his will, leaving the bulk of his estate, some £12,000, to his daughter during her life, but including a complicated set of legal clauses to ensure that after her death it should pass only to her female descendants. Whenever one of his teeth troubled him, Monsey had a most eccentric means of extraction. He would tie a strong piece of catgut around the bad tooth, then thread the other end through a hole drilled in a lead pistol-ball. That done, he put the ball into a loaded pistol, pointed it in a safe direction and pulled the trigger. Thus the tooth was jerked out. He claimed he never suffered any problems from using this method, but few were willing to let him use it on them. Eventually one patient, feeling a little braver than the rest, agreed to the procedure. The tooth was prepared but the pistol not yet loaded, when the poor man called out that he had changed his mind. “But I have not,” Monsey replied, “and you are a fool and a coward for your pains.” With that, he gave the string a sharp yank and the tooth came out. He also enjoyed making grisly remarks about mortality, often combining them with his dislike of pomposity and showing off. “I suppose he died Rich, but he does not rot a bit easier for that” is typical of Monsey’s gallows humour. You little confounded toad, will you, or will you not, send me a wing, leg, bit of the breast, rump, or merry-thought, of one of those chickens! As he aged, Monsey’s manners became even more rough and eccentric. Knowing that a good many young physicians had their eyes on the prize of his post at Chelsea Hospital after his death, he loved to invite them to visit him, show them around, then happily inform them that they would undoubtedly die before he did – which quite often proved to be the truth. Messenger Monsey lived into his 96th year, a remarkable age for his time, so it is perhaps not surprising that his wit lost much of its gaiety over time and became more biting and querulous. He quarrelled with those around him and gradually withdrew into a kind of morose solitude in his rooms at Chelsea Hospital. All those he had known as a younger man were now long dead and he himself seems to have become tired of his existence, plagued by insomnia and a heart complaint that caused him much anxiety. Even so, Dr. Monsey had one last piece of eccentricity to show to the world. He directed that after his death his body should be dissected before a group of medical students, then the remains thrown into the Thames. He died on Boxing Day (December 26th. ), 1788, and was anatomised exactly as he wished, though his remains were buried at Chelsea rather than thrown into the river. During his life and immediately afterwards, Monsey was quite famous. He was said to be the only person willing to contradict Sir Robert Walpole openly or beat him at billiards. When Walpole tackled him about it, Monsey is said to have replied: “They are looking for places [appointments and preferment]. All I want is a good dinner.” There was even a book published after his death containing anecdotes about him and examples of his wit and eccentric ways. Thanks to his luck at encountering the Earl of Godolphin and that nobleman’s life-long patronage, Monsey was rarely troubled with excessive work. However, by all accounts he was a good doctor and helped many during his life, both rich and poor. His abundant spare time was devoted to learning, so that he became a Fellow of the Royal Society and an associate of many of the most intellectual men and women of his day. Only Dr.Johnson openly disliked him, blaming his coarse manners. However, since Johnson was a Tory of the deepest hue and Monsey a thoroughgoing Whig and freethinker, the two were hardly likely to get along. Today, Monsey is virtually forgotten. Even his father’s church at Bawdswell has been almost completely rebuilt, thanks to a badly-damaged Mosquito bomber which crashed into it during World War II. Nevertheless, he used his chances to make a success of his life. His daughter, like her father and grandfather, made a good marriage to William Alexander, elder brother of the first Earl of Caledon, and was the grandmother of Robert Monsey Rolfe, the first Lord Cranworth and Lord Chancellor in his day. This entry was posted in C18th Norfolk, Norfolk Eccentrics. Bookmark the permalink. What a fascinating man! Eccentric, historical curmudgeons are always highly entertaining.